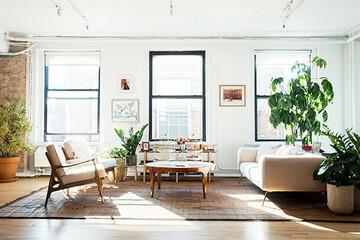 Like us all, Anne Bowen Dabney was looking for more space when she stumbled upon a 19th-century home and warehouse on a leafy corner of Spring Street. 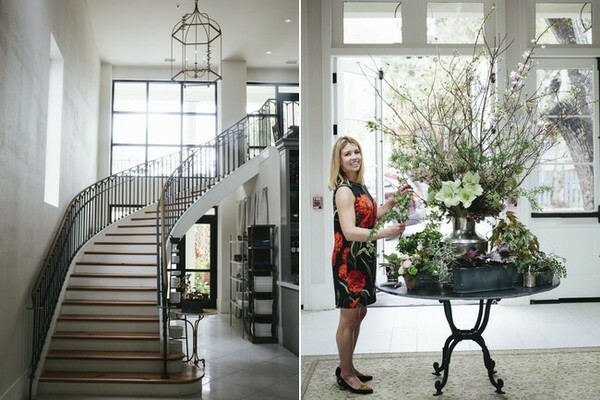 The founder of beloved Charleston-based floral design company Stems needed a place to store the detritus of the various occasions she had been creating arrangements for since 2010, but she quickly realized the property seemed like the perfect location for something even bigger. "The first time I walked through I knew it was something special," Dabney says. "So many things drew me in, but I think it was the fact that even though I lived and worked near the property, I had no idea it was there for so long. The warehouse, which is now our events space, is just so perfectly tucked in that you would never notice it walking by." 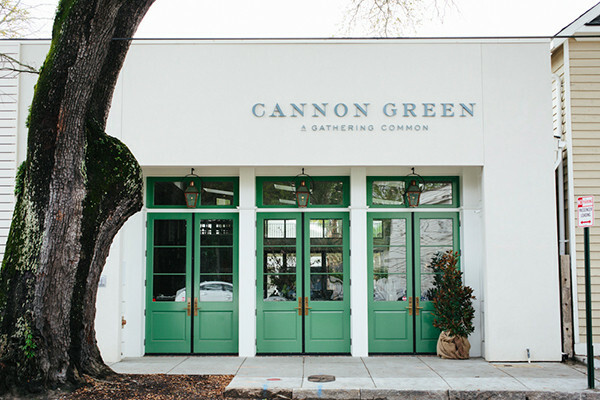 After months of renovations, the site is now home to Cannon Green, a buzzy new restaurant headed up by Amalia Scatena that fuses Mediterranean cuisine with Lowcountry specialties. To enhance the property's secret garden feel, Dabney set to work overhauling the dual structures, maintaining the building's 1840s façade inside the restaurant and the warehouse's original wood beams and brick columns while adding elements that would impart a natural feel reminiscent of the outdoors. 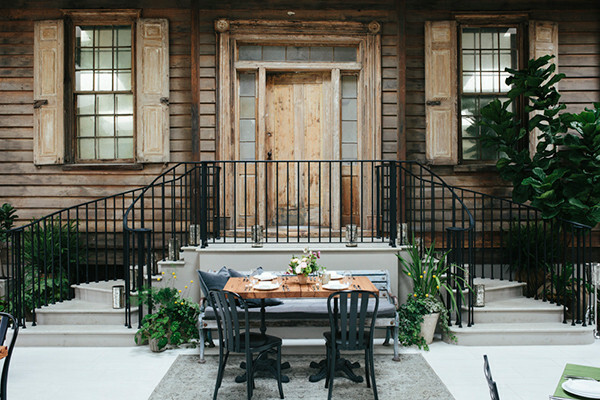 "It only seemed appropriate to treat the restaurant space like an extension of the courtyard, since originally it would have been outside," says Dabney of the structure's repurposed front entrance. 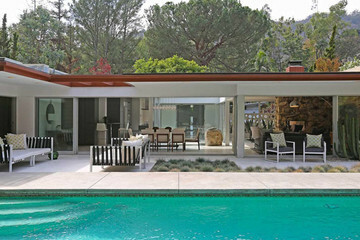 Here, five more ways she decorated with an eye toward a natural setting. 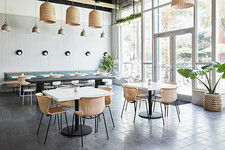 Dabney opted for natural light wherever possible, installing additional windows and skylights to impart an open feel throughout the space and link it with the pre-existing courtyard that connects the home (now restaurant) and warehouse. 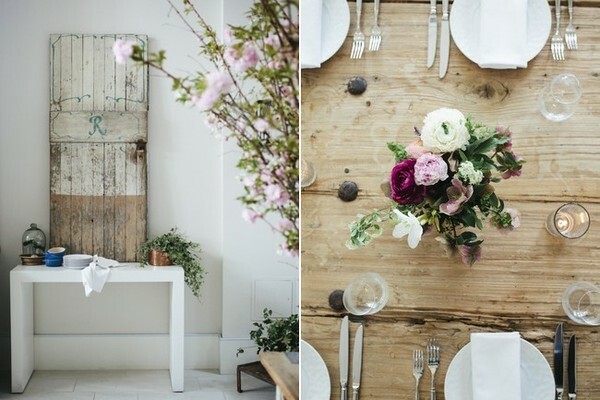 "The colors in the room—greens and grays—are supposed to be a nod to a garden setting," says Dabney. 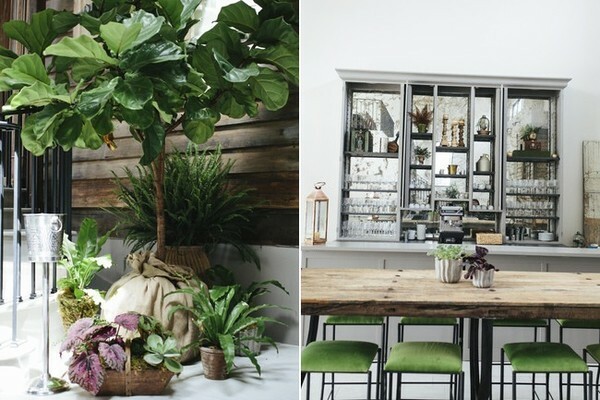 To keep the main dining space feeling light an airy, she painted surfaces in Sherwin Williams's Alabaster, then incorporated verdant touches throughout, in mossy velvet seat cushions and tabletops. Cannon Green's front doors were coated in Fine Paints of Europe's inviting Moorland Green. 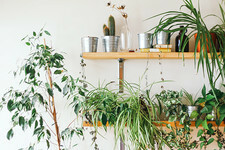 "We are constantly rotating lots of plants in and out of the space," Dabney says of the various fig trees, ferns, and flowering branches that occupy every spare nook. Still, Dabney suggests,"Keep it simple. If it's not adding something it's probably distracting. 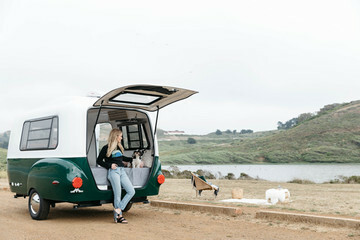 I'm not a fan of adding a bunch of things just to fill a space if they're not right—everything you add should be deliberate." 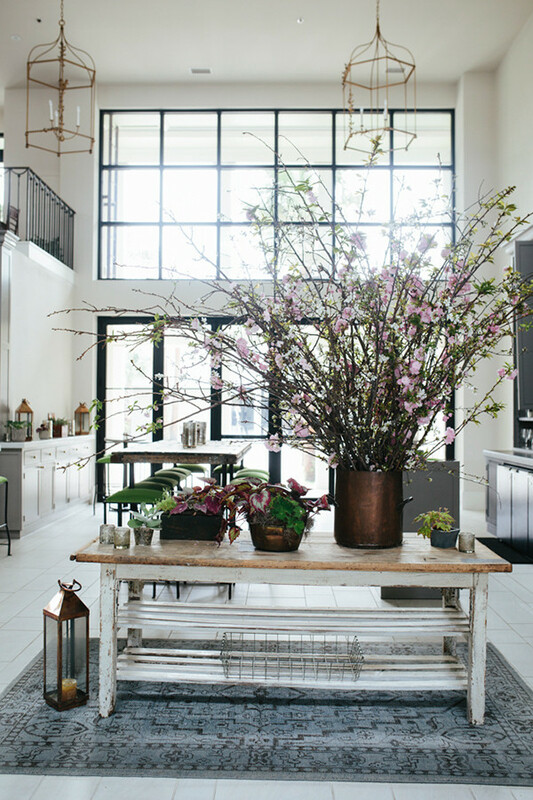 "We tried to use a lot of different natural materials and textures in the space," says Dabney (above), including reclaimed wood and warm brass and copper. "The floor is a tile that's meant to look like the travertine in the courtyard, and we wood-paneled the hallway to give it some depth. The chandeliers are made to look like the metal railings on the stairs. As for the façade windows, we used antique mirrors from Charleston Architectural Glass." 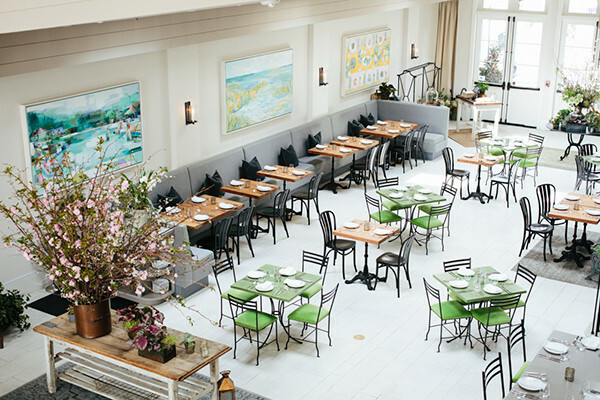 Many of the paintings on display throughout the restaurant are landscapes and water scenes, as well as floral still lifes and local figures, bringing an element of the natural world indoors. "I know all of the artists we have featured in the space, so they definitely all have special meaning to me," Dabney says. The collection includes pieces by Charleston-based Blakely Little (who once interned for Stems), and the New York illustrator Happy Menocal.